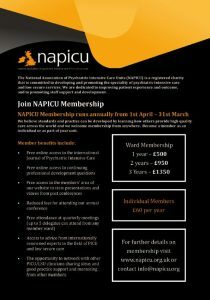 There are three ways to become a member of NAPICU – as an individual, a ward or an international unit. Wards and international units can choose from a one, two, or three year membership with an increased discount the longer you sign up for. If you wish to join NAPICU please follow the links below for the membership type applicable to you. To join NAPICU as a ward (£500 for 1 year, £950 for 2 years, £1350 for 3 years) click here to download the application form to complete and return to us. New members will receive an email with login details giving you access to the members’ areas of this website within 3 working days of receipt of payment. To renew your NAPICU membership you will be sent an email by the admin office mid march each year, please ensure you keep us updated with your current ward manager details. If you don’t want to join today you can always sign up to our free newsletter to be kept abreast of developments. Please send us your email address from the Contact Us page – or follow us on Facebook, Twitter or LinkedIn. We believe standards and practice can be developed by learning how others provide high quality care across the world and we welcome membership from anywhere.